With Christmas in sight & the end of 2018 looming, we start to think about many things: How much food am I going to eat? How much weight will I put on? (Both related). Will I like my presents? Will it snow? But before Christmas I want to take you back. Back to 120 years ago when a small company in France were celebrating a monumental occasion. On the 18th December 1898, the company Jeantaud made history for building a car that set a world land speed record. The speed that the Jeantaud Duc Fulmen hit was just over 38 mph. Since then, we’ve been obsessed with speed. Building cars that ultimately drive faster and harder year on year. In 1927 a vehicle known as “The Slug” was the first car to reach 200mph, a speed that’s achieved by most supercars today. Only 8 years later the 300mph mark was hit by Sir Malcom Campbell in the “Blue Bird”. 30 years on this record was doubled with the “Spirit of America” hitting 608mph and in 1997, the current world record was set at 763mph by the famous “Thrust SSC” driven by RAF pilot Andy Green. But that wasn’t enough for Andy, as he is likely to pilot a newcomer to the block - The “Bloodhound SSC”. This plans to beat the current record and make it untouchable for years to come, hoping to exceed 1000mph. However, it hasn’t been the simplest of jobs getting a car like this ready and earlier this year, the project went bust and the car was put up for sale for a mere £250,000. That’s £250 per mph! In comparison, a Ferrari 488 is a mind boggling £897 per mph, that represents great value for money! Luckily, a new investor has stepped in and the project is back on track and speeding towards setting a new land speed record once more. Shame though, would have looked great on my drive. 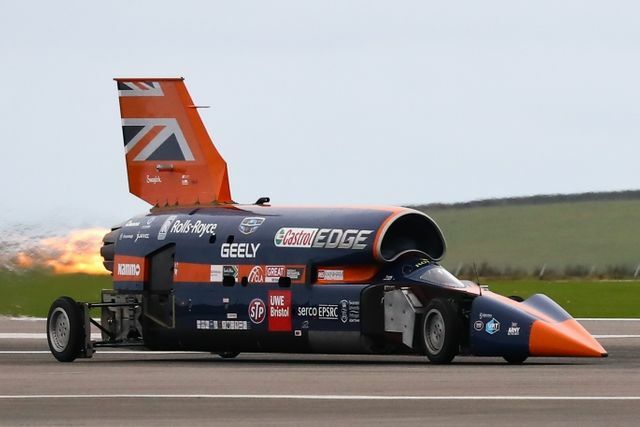 The Team are thrilled that Ian has saved BLOODHOUND SSC for the country. Its the best possible Christmas present for the many supporters around the world who have been inspired by the project. BLOODHOUND Project saved https://t.co/ieCgO4nc77 #bloodhoundssc via @bloodhound_SSC !!! FANTASTIC - congratulations Team Bloodhound High Five !! !